Open Sat 10 -6 and Sunday 11 – 5. Do hope you can come, it is excellent fun and usually informative – I have found some fantastic makey – do-ey people in my local area through this event, one, a jeweller, literally just round the corner! Of course the highlight will be coming to me! No 38 (take away dish or taxi car?). Or …..And this was Sunday… or A story of a miniature Georgian dress. An account of John Lombe’s silk-mill at Derby, 1791, from Wm Hutton’s History of Derby. Wanted to base it on an extant silk garment from the era, or a contemporary portrait. Settled on this – drawn up by Janet Arnold, so I had shapes to work from, the dress is in the Manchester collection. That was 9am, it is now late afternoon. It is not quite finished, but my hands hurt so a rest is required. Did the text on the new machine (yet to be named)- a bit ambitious but well…. but all the rest is hand sewn. Haven’t managed to include all the text, but the gist is there, in various degrees of control and legibility. The shoulder band will define the dress more clearly but I think the collar will change to something more like the LACMA redingote below ( really wanted to do this one all along, bigger scale required though, it is all in the buttons). This one might be love. “Midsomer Murders” has just come on, time to vegetate until I get over it! Update – went back to sewing to get over Midsomer. Put in the shoulders and finished the bodice front off. Just the collar and then all the usual dithering about getting the feel right – ephemeral, used,, ghosting – a bit like an incomplete memory or an echo. Certainly not squeaky new and toothpaste white! Don’t forget York Open Studios is on next month. The next Stitchy Day is April 5th – if you fancy having a go at the freehand thing- check the frantextiles facebook page for details or email. Focus this week has been words and dress again. Thinking and presenting is happening on the landscape side as well as workshops, but that is creative background noise. In the foreground is a mini short frock coat and waistcoat. I was reading around the early Factory Acts but found the texts dry and eye watering in just about every respect, so went back to writing on clothing. The combining of primary sources with items of dress seems right. Both seem to become more, that little bit of context adds a bit life to the understanding of both. I like the idea of using simple fabric, of ‘ghosting’ the garments rather than finishing them. This isn’t about making replicas or fancy dress. That they are only part there, that what is seen and read is incomplete and only part of the whole narrative feels appropriate. This of course leads to many mini crises, how much HAS to be done, how much is choice, how much can be undone? I have hand sewn these, there is no seam or hem finishing or linings, but why not? I could print these documents onto fabric and cut the garments out of that and make them up like good little article of clothing. Why not machine sew? The text is machined…. and does it matter that the words can be very hard to read? Nope, try reading any hand written document! Some of the reasoning I think I understand, it is a touch Romanticism, a touch pragmatic, and very contradictory, of course. I want to take time, to have to sit and think, I want to share not preach or shout, I want it to be as unfinished as I am, and as the original people were in these documents. I have seen a tiny part of them, their world continued without me. I don’t want this to be subtext driven or a historical crusade. In part, this is trying to get below the headlines only approach, behind the obsession with dates and facts which was my own education. I like history but not museums, nor increasingly, history books, so this is my response. This is personal, it is not meant to be deeply meaningful or massively insightful. Glad I have that out of my head, it can live on ‘paper’ and not clutter me up. In celebration I have just wandered up to the local shop for treats, and managed to do that with one leg of my jeans peppered with needles and pins…..not much changes. Meet my new friend -this is the ceremonial robe of the Master of the Guild of Merchant Taylors. I am to make a new one! It is showing its age on some of the seams and trims but is still a spectacular piece. It is medieval-ish in concept, elaborate sleeve treatment, heavy, dramatic trimmings, and with seams on the front and back of the shoulder. It is also wool, half lined, rather large and very heavy. I shall call it Ronald. The sleeves are the big thing- open underneath with a cape to the back and a cut opening for the cuff, then finishing with the sleeve tube hanging down to hem level. Not the conventional approach. There is an extra seam following the lower arm hole – haven’t worked out why yet. Ronald is a robe of mystery. holding the sleeve away from the side to show the cape. Love the pleat detail on the back waist and button on the collar. First make sense of this one, then draft a copy to get the pattern pieces, then change the sizes to suit the incoming master, and construct a toile. They are thinking of an update – making it more coat like- but would feel good to keep at least a nod to the history. We shall experiment a little and discuss at the first fitting. Stitching with Colour – 21st January – Day course at the Viking Loom, York. 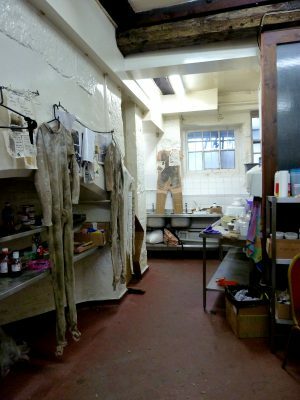 Messy Days – 1st & 5th Feb – kitchen sink dramas playing with staining, microwave dyeing, etc. Simple ways of working with wet media to add colour for stitching. Literally at my kitchen sink in York. And upcoming exhibition at Blossom Street Gallery. Wrong title, it is all tangents. Been thinking about more 3D-iness. A kind of book form made to stand partially open with a few interconnected leaves. Too be honest this idea has been niggling at me on and off for a long time – years. There is a little collection of protobookthings in the bin and the way forward is not entirely clear. The current experiment is not visually exciting at all, being a piece of cotton lawn drying flat. 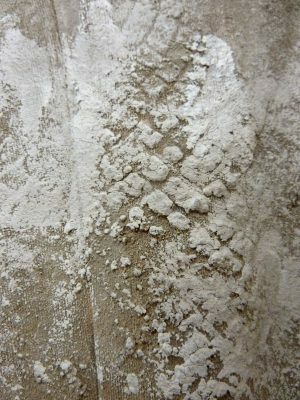 This I hope to become the book covers – it has been dunked in PVA solution so should dry fairly rigid. So in the mean time I have amused myself by making a miniature 1840s day dress to glue. I blame Jane Eyre. And the Bronte sisters drama broadcast over Christmas. And the general Dickensian goggles that seem obligatory at this time of year. For those of you into historical costume, Janet Arnold’s books may be familiar. She went around public and private costume collections in the 1970s drawing and measuring. She produced a series a books showing the evolution of dress and dress construction with scale diagrams of all of the pieces used. I simply traced off an 1840s dress pattern and with a few adaptations, sewed it all together. The finished garment is about 8″ high. pleats on the sleeve head instead of gathers -more stable at this size. The small scale does pose problems. My fingers are too big, the needle was longer than some of the pattern pieces, and seam allowances are dictated by the fabric!, hence the lapping at the waist. This is not pretty so a cord detail will be added later to cover this. The neck will be turned once the glue has stabilised the edge. The dress is at the first dunk stage. The bodice and lower skirt are stuffed with clingfilm and bubblewrap until they set, which is why they look dark. The shape of the skirt also needs some tweaking. And this was done for fun. I must remind myself that this was fun. Even when peeling PVA off the kitchen top – this was fun. You may remember that I mentioned taking on a workroom supervisor job for the York Mystery Plays- well, that is where I have been and below is a tiniest snippet of what we have been doing. These are a cycle of plays telling the Bible story, start to finish, and this year are held in the nave of York Minster. Basically this means they are big, in all ways. Traditionally they are put on by local guilds for the local people. These are a bit too big for that but most of the cast are locals as are the people running about behind the scenes making and doing. I have been one of the people translating and organising the designs and intentions of the decision makers into tasks and actions for the volunteer costume makers. Not going to give you sneak peaks of the finished stuff or write about the “Biblical Basics” , of which there were dozens to make, many sagas to tell and the word “gusset” has new emphasis, but…. meet Adam and Eve. 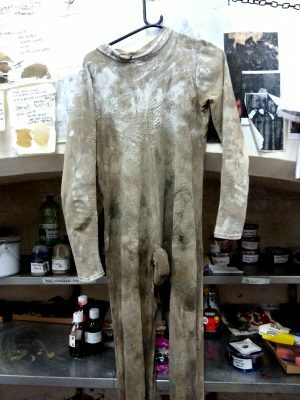 These were somewhat different from the floor to ceiling robes – body suits which had to be made to look like they were emerging from the clay. Janet ( the theatrical breakdown specialist) trusted us to get the base grime and grub in place, ready to start building a heavily caked and encrusted top layer. These are not finished yet, more Yorkshire clag and clarting up is required but you should get the idea. 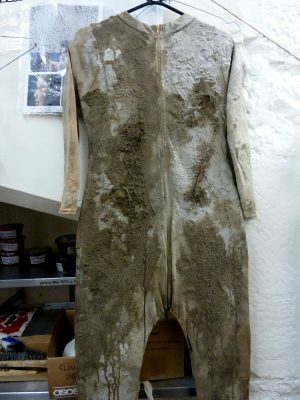 Eve is a little more advanced than Adam, proper crusty mud is going on. 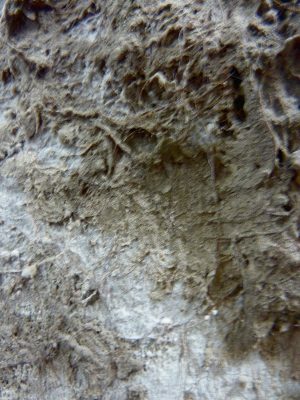 The grub was various colouring agents in textile binder, then plus some extras – wool fibre, puffer binder, polyfilla, etc, etc. The heavier layers were stippled , slapped, dribbled on, as well as being elegantly placed, and carefully applied. It is the drying time that is the killer. Everything is overnight! Janet is working minor and major miracles here! From flat nasty synthetic bodysuit to this organic masterpiece….